2. Wire length 0.2M, Bluetooth 4.0 specification. 3. As long as the phone has Bluetooth, you can connect to the Audi audio. 4. This product has a button, you can switch the U disk and Bluetooth mode, red and blue lights indicate the status. 5. 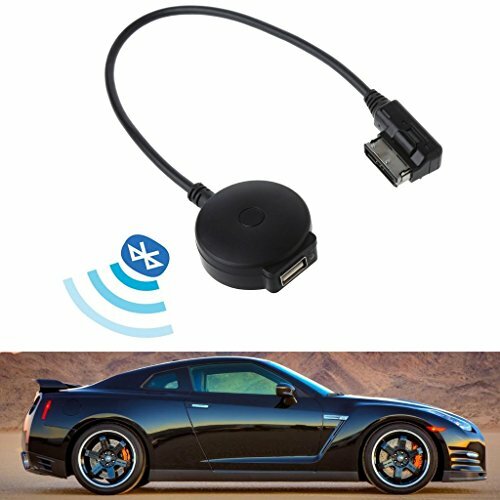 Bluetooth mode, after the successful pairing of the phone and Bluetooth, you can choose music playback on your phone, and the car audio can be played. 6. U disk mode, as long as the U disk has songs files, plug in this line of USB interface can be, the car audio can play. 7. Supports pairing two smart devices at the same time. Attention: Only suitable for the car with 3G MMI System, neither 2G nor 3G+ !!! USB charger (LED). Wire length 0.2M, Bluetooth 4.0 specification. As long as the phone has Bluetooth, you can connect to the Audi audio. This product has a button, you can switch the U disk and Bluetooth mode, red and blue lights indicate the status. Bluetooth mode, after the successful pairing of the phone and Bluetooth, you can choose music playback on your phone, and the car audio can be played. U disk mode, as long as the U disk has songs files, plug in this line of USB interface can be, the car audio can play. If you have any questions about this product by Fucung, contact us by completing and submitting the form below. If you are looking for a specif part number, please include it with your message.